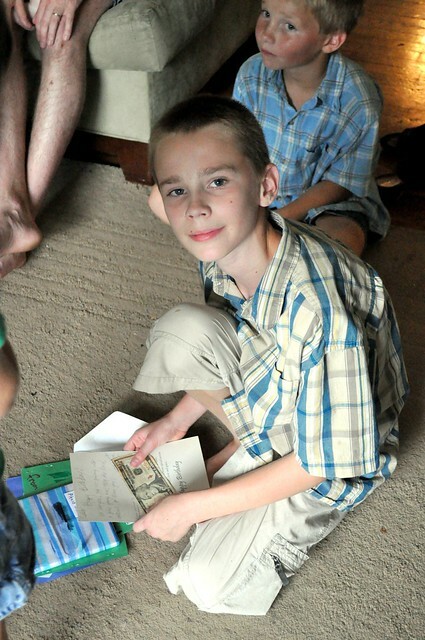 We celebrated Caleb's birthday on Sunday afternoon. He also went laser tagging twice, once on Sunday with cousins and again on Thursday with friends. Math is review for all four kids. They're spending time getting extra practice on things we are still struggling with and skipping through problems that they fully understand. Caleb studied survival skills in Science. 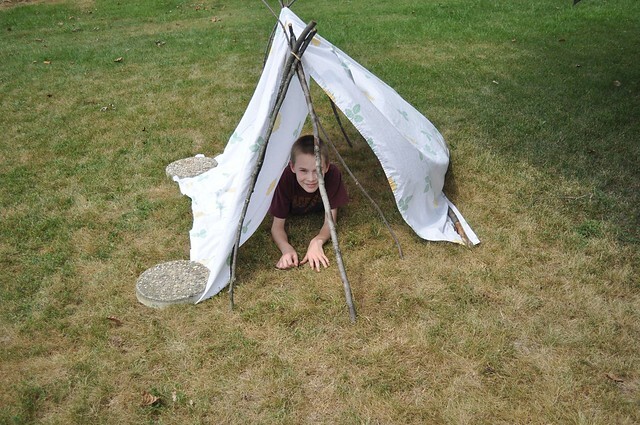 He practiced building a shelter of his own. We all studied mollusks and worms in science and made notebook pages for them. The boys tried to dig earthworms to observe, but they said the dirt was just too dry and they couldn't find any. In geography, we made paper mache earths. The round balloons I bought were a little smaller than I thought they would be and weren't nearly as round as I had hoped. 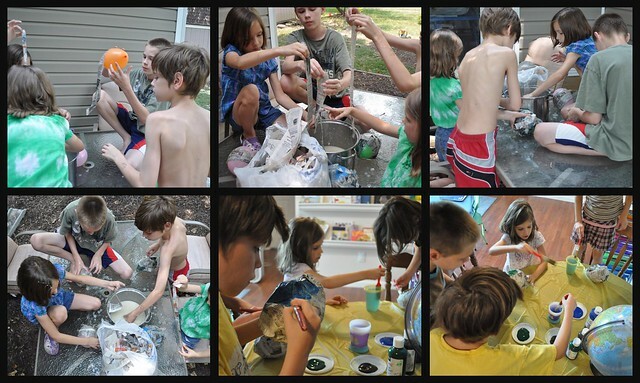 But, I think the kids enjoyed the project (although they didn't enjoy the second and third layer of paper mache nearly as much as the first). We got one layer of paint on them, but I think they'll need a few more. Hopefully, next week I'll have pictures of the finished projects. In history, we finished the unit on South America. Caleb finished reading By the Great Horn Spoon! . Josiah read parts of Gold Rush Fever and started Stuart Little . Rachel read Nate the Great , The Long Way to a New Land , and When Jessie Came Across the Sea . Jada read a lesson and a half in Sonlight's I Can Read It. We read five chapters of Moccasin Trail for our read-aloud. 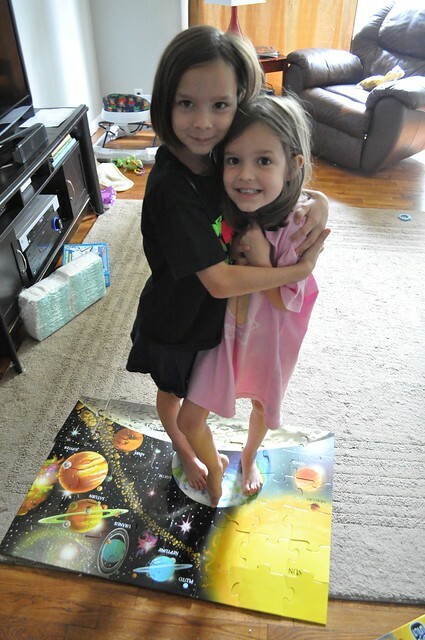 The girls built a floor puzzle of the solar system one day. In the first picture their standing on the sun and they're shouting because they're burning. 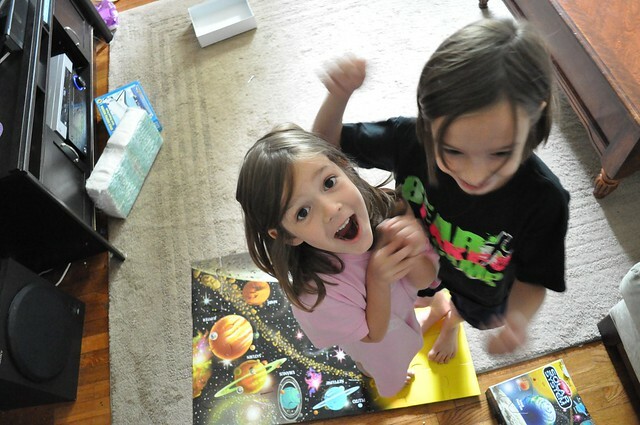 The second picture they are standing on earth ... their home. Looks like a good week! I'm anxious to see how the paper mache project turns out!